I love roasted vegetables - they're so healthy, easy and delicious, and when paired with couscous, as in this recipe, they make for a quick full meal, as couscous is just as quick and easy to prepare. For a vegan version, omit the feta cheese. 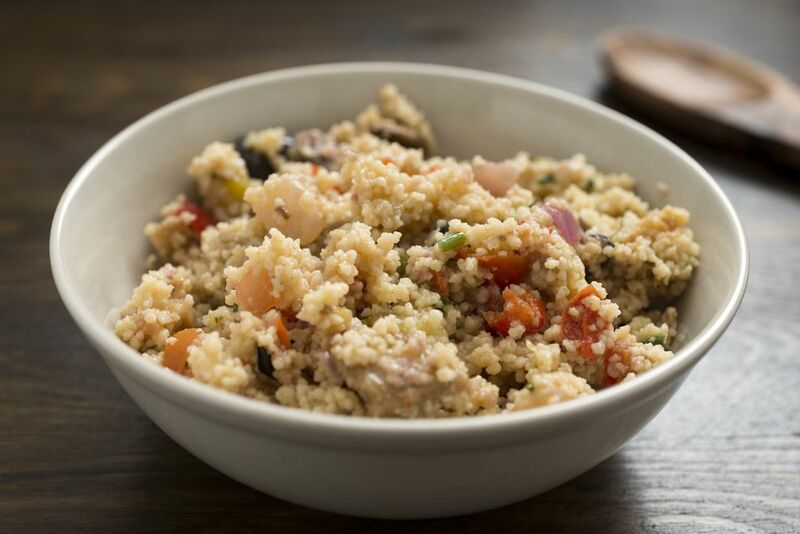 For extra protein, use quinoa in place of the couscous. Recipe by the Wheat Foods Council. Combine bell peppers, zucchini and yellow squash. In a small bowl, whisk together the salt, pepper, garlic, seasoning, oil and balsamic vinegar and toss with vegetables. Spread vegetables evenly in sheet pan and roast for 10 to 12 minutes or until vegetables are crisp-tender. Allow vegetables to cool slightly, then toss with remaining marinade, couscous and feta cheese. Nutrition: Each serving provides approximately: 306 calories, 1 g protein, 43 g carbohydrates, 4 g fiber, 10 g fat (4 g saturated), 21 mg cholesterol, 26 mcg folate, 1 mg iron, 655 mg sodium.